GRAND RAPIDS, MICH - There are many ways to measure the true size of a sport show. Attendance, of course, comes to mind. The number of exhibitors and variety of features are other standards. Another clue is the breadth and depth of the seminar schedule. At the 67th Annual Ultimate Sport Show, March 15 to 18 at DeVos Place, 303 Monroe NW in downtown Grand Rapids, patrons can take advantage of 118 hour-long seminars. Except for three intensive weekend Super Clinics, all seminars are free with paid admission of only $10 for adults and $4 for children aged 6 to 14. 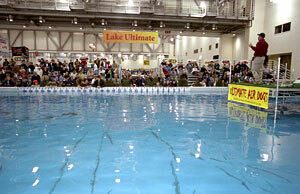 The non-stop instruction by 35 local and national experts occurs on five separate stages, including Lake Ultimate, a 110,000-gallon indoor lake stocked with live trout. Lake Ultimate speakers will deliver real-time, on-the-water instruction from fully rigged fishing boats floating on the lake. The show’s five seminar platforms provide producers with scheduling flexibility and show patrons with a huge spectrum of choice. On average, a new seminar begins every 30 minutes over the four-day event, Michigan's oldest sport show, which began in 1946 and has occurred every year since. No outdoor sport show in America has a larger or more diverse range of seminar topics. Johnnie Candle, Winner of the MWC World Walleye Championship in 2010, Candle is a professional guide on Devils Lake, ND but also has extensive experience fishing walleyes all over North America. A frequent radio and TV guest, Candle offers entertaining and educational seminars to help anglers learn the fine points of catching walleyes. Will Schultz has caught and released thousands of muskies over his 30-year-long career as a professional guide and tournament angler. The Michigan native is a chapter president for Muskies, Inc. and is one of the nation’s foremost authorities on the species. Dave Mull, editor of Great Lakes Angler magazine, will share “New Techniques for Great Lakes Trolling” Thursday through Saturday. Don Watts, Michigan native and bass-fishing pro will lead the all-new Bass Super Clinic on Saturday from 3 to 5 pm. Winner of many tournaments throughout the Midwest, Watts will explain in detail how to fish jerkbaits, crankbaits, jigs and other specialized lures in a variety of conditions. The intensive 2-hour clinic costs $25 with each attendee receiving a “free” gift valued at more than the admission fee. Students who sign up Thursday or Friday will receive free admission to the Saturday workshop. Theresa Maybrier returns from her Kansas City, Missouri home after a three-year absence to regale audiences with her expertise on hunting, finding, preserving and preparing wild morel mushrooms. In 2009, her daily seminars were standing-room only. Doug Samsal is a Bass Pro Shops preferred guide and an expert on southern Michigan gamefish. His seminars are “Casting for Muskies” and “Spring Smallmouth on Lake St. Clair.” He specializes in catching big fish. Marianne Huskey surprised walleye anglers last year with her expert knowledge of the popular gamefish. “Walleye Woman,” as she is known among her peers in the all-male AIM Pro Walleye Series tournament trail, is highly involved with introducing kids to fishing. Her seminars are first-rate. Tommy Skarlis holds the best active qualifying streak in the Professional Walleye Trail World Championships at 12 in a row. An expert on Lakes Erie and St. Clair, the Detroit River, Saginaw Bay and the Bays de Noc, Skarlis will arm seminar attendees with the tools they need to catch more walleyes. Mike Pittiglio is a muskie-fishing expert whose Lake St. Clair tactics have made him a favorite guide’s guide. “Trolling for Big Muskie” is his topic. Tim Fox is a professional trainer of hunting dogs that point birds. A breeder of top-drawer Llewellin setters, the Kent City native and part-owner of Shooting the Breeze Hunt Club, describes “No Command Training Techniques,” a modified version of the innovative Rick and Ronnie Smith training system. Richard Holm, a Lake Michigan charter captain from Indiana, will explain how to fish for Great Lakes perch. Denny Geurink is one of America's top wild turkey hunting experts. He will speak Thursday, Friday and Sunday on "Turkey Hunting in Michigan" and will host the annual Turkey Hunting Workshop on Saturday from 10:00 a.m. to Noon by the Grand Valley Chapter of the National Wild Turkey Federation. Expert meat cutters from Country Smoke House in Almont are bringing a whole deer to the Main Stage at 6 p.m. on Saturday to show patrons how to properly dress, skin and process the animal.